I finished 30 books in 2017. It was a good year for reading–nine perfect scores, including three in a row! The biggest development was getting new glasses over the summer–after suffering headaches that slowed me down for far too long, I finally took care of this, and I got much more done after. On the downside, I now see some big holes: no poetry, no science fiction or fantasy, not nearly enough of what I started the year wanting to read. Alas. Still, a great time. A tour de force of satire, and an absolutely perfect portrait of late 20th century us. A huge achievement in making us look at our warts in the mirror and laugh our heads off at them. By far the best American novel of the 90s. Incredibly fun puzzle mystery, without being ponderous or pandering. A flawlessly fun read. The first Jeeves and Wooster book I ever read, and still the best. We all type LOL every day, it seems, but how often does something actually make us laugh out loud? This book did, many times. I didn’t think a 1000 page novel about a British business executive in Hong Kong in the 60s could be the most exciting, engrossing adventure story I’d ever read, but here we are. A phenomenal achievement of the mind, this little collection of stories has history’s greatest difference between the simplicity of the narratives and the depth of the ideas. The bleak setting, the haunted and violent saga, the elegantly complex plot and style: this is the greatest novel from 19th century England, which is saying a lot. A surprise, just like Noble House. Who would have thought a long, rambling Western would also be the most humane, exciting, passionate celebration of life I’d ever see between two covers? I wish I could read it again for the first time. The cover of the current paperback edition calls it “science fiction’s supreme masterpiece,” and if anything, that’s playing it safe. This majestic epic broke all the rules, and in doing so, wrote the ones we’ve been following ever since. The one and only truly counter cultural book I’ve ever seen–a story so bogglingly original that it has endless surprises and challenges for everybody…and is genuinely funny on every single page. It’s difficult to even begin describing the wonders of this super masterpiece. Let just one bit of praise suffice: this grand work has the best rendering of life’s very largest dramas and its very smallest details. One or the other would be enough to put it on this list, but it has both. Amazing. I’d also like to make lists of books where the title is an allusion (The Grapes of Wrath, The Sound and the Fury) and where the title is a complete sentence (Death Comes For the Archbishop, The Heart Is a Lonely Hunter). I’m still inspired by this guy. I’m reading his book about the Nile trip right now. After reading this great post about the ten books that most influenced an author over at First Thoughts (one of my favorite blogs) a few weeks ago, I’ve been working on my own list. The list changed drastically over a few drafts, and I’ve been surprised by the final results. These are not necessarily my favorite books (though many of them are), nor are they what I’d consider the best books I’ve read (though, again, some of them are). These are the books that have most contributed to who I am today. For better or for worse, these are the ones that stuck with me, changed me, that left some deep imprint impossible to explain me now without. The only caveat here is that I decided not to include any scripture on this list. For it to be accurate, they should be on here, but I ran into too many problems. Should I count them all as one monolithic book called “Scripture,” separate them into Standard Works, or separate them even further into individual texts by author? The more I broke them down, the more I had to wrangle with how to rank them. It got too thorny, and I just decided to ignore that altogether for this list. The original list at First Thoughts, along with many of the comments afterwards, cheated by doubling up on books and squeezing more than ten onto these “top ten” lists. This draft has significantly fewer than my first couple, but I’ve still elected to cheat, also. My top ten list has twelve titles. If you really want to be a purist, cut off the last two. I’ve listed them here roughly in order of just how much they’ve shaped me, and I’ve included the general period in my life when I read them. 1. 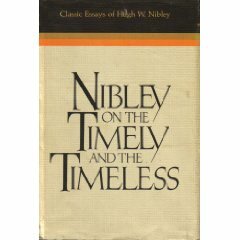 Hugh Nibley, Nibley On the Timely and the Timeless (college). This isn’t my favorite Nibley book (his Book of Mormon works or Approaching Zion would probably get that nod), but this “greatest hits” collection deeply impressed me at the time with its range of classical literacy to social criticism to studious, spiritual discipleship. It was the first Nibley book I read cover to cover, and started me on the path to the rest of his oeuvre. The way that I read scripture, study history, and understand the practical relations between things ancient, esoteric, and pragmatically modern are all heavily influenced by his life and work (though, since reading his biography–which I took with me to read on my honeymoon because it had just come out and I couldn’t wait to start it–I have attenuated this idolizing a bit and tried to expand my circle of influence). Undeniably, his books have had more of a profound effect on me than any other. I bought an old copy from E-bay several years ago…right before it was reprinted in a new edition. 2. Hopkins and Sugerman, No One Here Gets Out Alive (high school). I owe this one to my older brother. Like all boys, I worshipped my older brother, so when I was old enough to emulate his adoration of classic rock, I followed suit. I came across this biography of Doors frontman Jim Morrison and devoured it. For a moody, pretentious adolescent, it provided a role model worthy of my own egomaniacal imagination. This book’s influence reached far beyond my devoted memorizing of every note on the legendary Best of the Doors two CD set. Even back then, I would read biographies with an eye especially keen for what great people had done at my age. Morrison had been, above all, a voracious, even a ferocious, reader, and a nascent poet. 1. Develop yourself by self-discipline. 2. Joy comes through creation — sorrow through destruction. Every living thing can grow: Use the world wisely to realize soul growth. 3. Do things which are hard to do. 4. Entertain upbuilding thoughts. What you think about when you do not have to think shows what you really are. 5. Do your best this hour, and you will do better the next. 6. Be true to those who trust you. 7. Pray for wisdom, courage, and a kind heart. 8. Give heed to God’s messages through inspiration. If self-indulgence, jealousy, avarice, or worry have deadened your response, pray to the Lord to wipe out these impediments. 9. True friends enrich life. If you would have friends, be one. 10. Faith is the foundation of all things — including happiness.